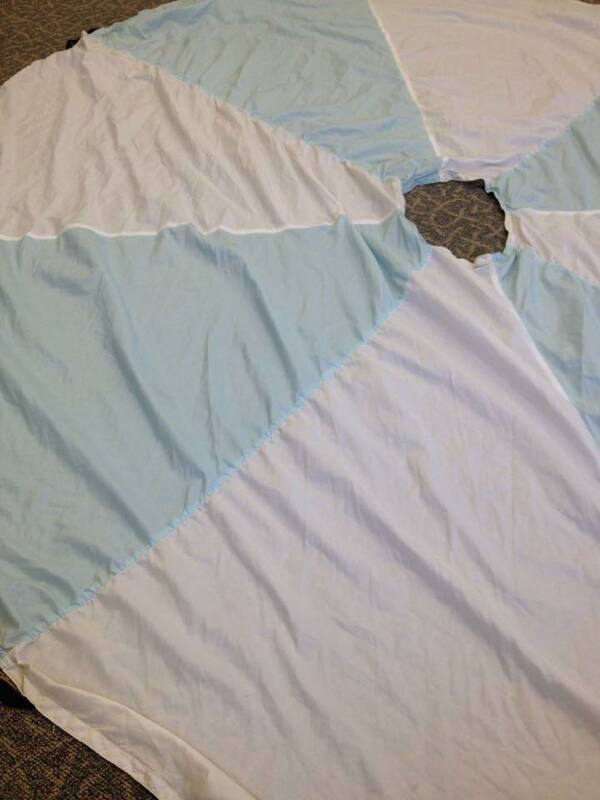 A while back I posted about a Parachute Storytime I did as my baby storytime theme. It had been a while since I used that storytime, so I decided to dust off my parachute and try it again. This time I did it with several different age groups and added a few new songs to the mix. I have now done this with babies, toddlers, preschoolers, and families of many age groups. It works with all of them. For babies, I recommend parents sitting Baby on their laps and letting them just feel the air and watch the parachute go up and down. For toddlers, preschoolers, and school agers, I let them hold on to the parachute and participate in the movement. You have to know your audience, though–that is the key! For the most part, I followed my previous plan. This time we started by shaking the parachute fast and slow, up and down several times to warm up and go over the “rules.” I also started with the book Jump by Scott M. Fischer. It gets the children excited and warmed up. I like the addition of the book. The children know it’s time to start and get excited every time they get to jump in the air. I also added two new rhymes. London Bridge was fun, but many children don’t know the rhyme so we did it twice and moved on. Five Little Monkeys is a little long, so depending on your group, you may want shorten it to just three monkeys. If you read the original plan, Toast in the Toaster and Popcorn are still the rhymes we repeat the most. Next time I do this storytime, I plan to add in a little finger warm-up with Wiggle Them. I just acquired a parachute and looked at your older post for ideas on how to use the parachute with all age groups! Love your ideas and songs – thanks!